Market survey shows that prominent yet wrong concept regarding the "expensive" LED work lamps have been, in one way or another, influencing their global sales. The mistake that LED work lights are expensive has kept millions of potential buyers away from seeking the benefits and power-savings of such led lights. However, manufacturers of LED work lights are striving to reduce the impact of such misconceptions by introducing the latest capabilities in current product lines, and by extending the durability & power efficiency of new products. 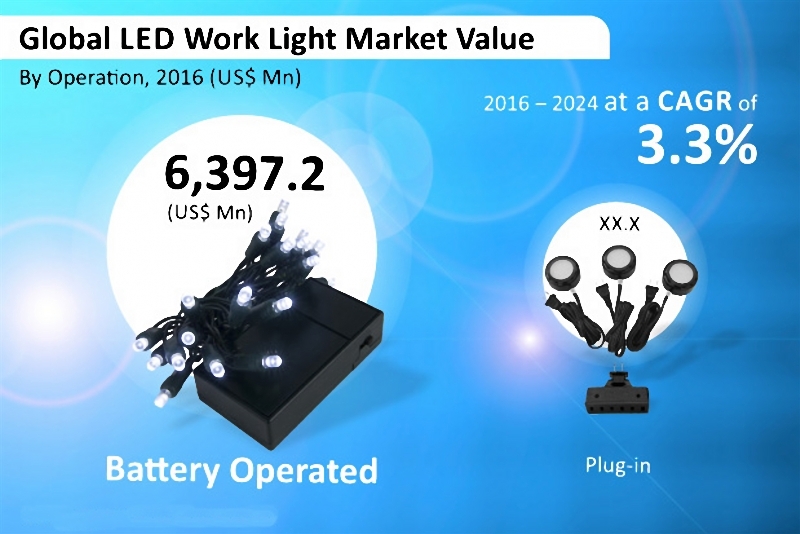 It is estimated that the global LED work lights market procured reached up to an approximate value of US$ 8,195 million in 2016. Also, the global market for LED work lights will continue to grow moderately at 3.3% CAGR to reach US$ 10,661.3 million value by the end of 2024. Regarding the volume, more than 1 million units of LED work lights will be consumed globally by 2024-end. Despite the disadvantages, factors such as growing online sales, rising demand for explosion-proof work lights, and rapid urbanization will continue to encourage the global LED work lights sales in the years to come. Seven out of every ten LED work lights sold on the market are installed with battery packs. This clearly meas a higher preference to battery-operated LED work lights as opposed to plug-in products. In 2016, more than 660,000 units of battery-operated LED work lamps were sold globally, over 60% of which were rechargeable ones. On the other hand, global consumption of plug-in LED work lights is predicted to reach 315,000 units by the end of 2024. Relatively, most of LED work lights being used for multiple applications are likely to be flashlights. The global market for LED work lights will keep seeing lucrative growth for flashlight products, revenues from which will account for over 55% value share. Demand for lanterns is also expected to grow at a attactive pace of 4.3% CAGR, while spotlights, clamp lights and other LED work light products will not be leading on their global market presence. Lifestyles and environment-friendly choices of consumers play a very important role in seeking potential buyers for LED work lights. Among which, Europe is expected to remain the largest market for LED work lights in the world. With more than one-third share of global revenues, Europes LED work lights market value will rise modestly at 3.1% CAGR. Meanwhile, Asia-Pacifics LED work lights revenues will take a relatively faster growth, registering a 3.8% CAGR. For North America, the projected LED work lights sales are likely to hit close to 210,000 units by the end of 2024. Leading manufacturers of LED work lights listed in the world include, ABL Lights Inc., Bayco Products Inc., Cooper Industries (EATON Corporation), Streamlight Inc., Ericson Manufacturing Co., Larson Electronics LLC, WF Harris Lighting, Luceco plc, and Lex Products Corp.